Tennsco Kompakt Systems is the leader in safety. For over 45 years in Dickson, TN, Kompakt Systems has been manufacturing a sound, structural design that comes standard with a visible, positive, anti-movement lock. 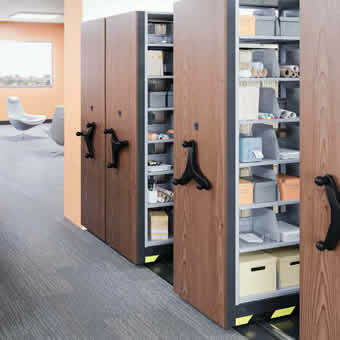 Kompakt Systems provides the widest range of movable storage available in the industry today. 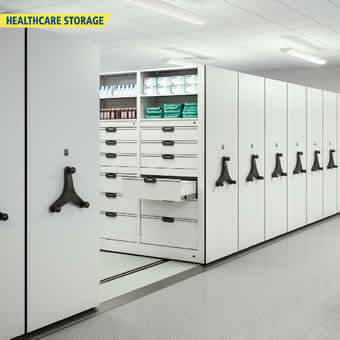 Kompakt Systems can assist you with choosing the best mobile storage system to fit your exact needs. 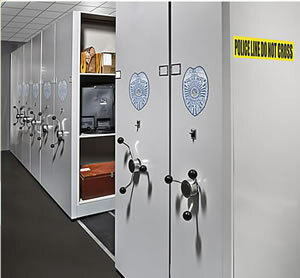 Each year, Kompakt Systems aids thousands of companies in saving millions of dollars through their revolutionary Mobile Storage System. With Kompakt Systems, you will get the option of doubling your storage capacity or saving up to 50% more floor space; the choice is yours. Call NationWide Shelving today and let them convert your operations into a time and space-maximizing material management system. Kompakt Systems stands out from its competition with their innovative 1” Rail Design and 11-Gauge welded carriages, allowing their Mobile Storage System to withstand even the heaviest of loads. In addition, the gear drive ratio is capable of moving up to 10,000 lbs. with 1 lb. of effort. Each of the carriage wheels are composed of 5” machined steel and are dual flanged, with a total outside diameter of 5.38”. 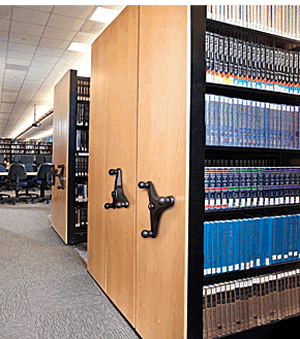 Kompakt Systems is the only mobile shelving manufacturer to offer self-supportive rail with steel shims that do not require grouting. Typically, other manufacturers use ⅝” wide bar stock which requires grouting for additional support, but Kompakt Systems uses a high quality 1” x 1” square C-1405 steel bar stock. Kompakt Systems also offers a center groove rail, which prevents any gaps in the floor installation.